How will humanity explore space? Full Worlds is an ethnography podcast where we meet the worlds of its creators. 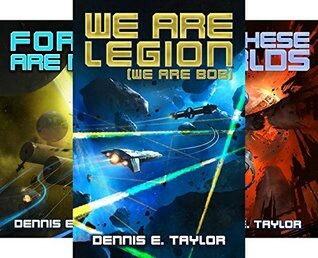 In this episode, we talk to Dennis E. Taylor about the world of the Bobiverse series. The Bobiverse is about an uploaded mind controlling a Von Neumann device. A von Neumann probe a self-directed space probe that flies through the galaxy and makes copies of itself from locally produced raw material. You send out one, it turns into two, which turns into four and so on. The Bobiverse treat many interesting subjects — from uploaded minds to exo-species to asteroid mining, but a central topic is how we will explore space. We will pursue multiple strategies. We will try to send out humans, von Neumann probes, non-replicating probes that just beam back what they find to earth. The question is: What is the fastest way to get to where we want to be. If we can upload a brain to silicon, write an AI, or freeze and revive humans — we will use whatever works to get outside the solar system. Then there is, of course, the question of why we should go into space? There are both interplanetary and interstellar goals. We need to figure out a backup plan — a Yucatan meteor impact, a designed virus, or climate change forces us to get a backup plan for humanity. We need to get off Earth and not have all our eggs in one basket. Getting outside our solar system requires leaps in technology and the drive is different. Even if humanity is gone, or not part of the journey doesn’t matter. Exploration is just curiosity. With our current plans to go to Mars, we do have a bit of an ethical challenge. Because what if there is life on Mars and we would destroy it? The Prime Directive — that you shouldn’t interact with other exo-species — is already a matter for our plan to go to Mars. There are opinions all over the spectrum, from extreme colonists who think we are the biggest baddest species, to the people who think we shouldn’t even go to Mars of the risk of meddling. If there is life right now, we have to be very careful. If there is life from the past, then we should treat it like an archaeology site and just tread lightly. The Bobs in the Bobiverse live the libertarian dream in a post-scarcity world. But, interestingly, independence and freedom aren’t all easy. Bob is the singularity in a very real way. He has his own intelligence and goals, plus immortality and the ability to replicate — and no dependency on anyone else. The Bobs don’t have to depend on anyone for anything. You can’t coerce them, you can’t blackmail them, you can’t bribe them. That means they are like a heard of cats. They recognize each other, they interact, but there is no society. There are conflict and tension, but each cat is a nation of themselves. Even in a post-abundance free society, there will be tension, for example: if we have a libertarian society being invaded by a non-libertarian society — should we organize to fight them off? And, if so, are we still libertarian? An interesting tension in a totally independent world is that there is little need for cooperation. And, as Dennis says, the biggest takeaway from the books is that cooperation and work towards shared goals are the keys to get more things done. Listen to the conversation to hear Dennis talk about computer games, introversion, and many more things. To see more about the Bobiverse go to GoodReads. To keep up to date with the Podcast, follow Full Worlds on Twitter, and check out the other interviews on Full World’s Medium Publication. In Full Worlds, we hear authors and creators explain the worlds they built, without the story getting in the way. An antropology podcast.